Dancers David Schultz & Alice Klock in "I Can See Myself in Your Pupil". Photo by Todd Rosenberg. For two of the three new dancers added to Hubbard Street Dance Chicago‘s (HSDC) roster this season, it was a new road traveled. Alice Klock and David Schultz – 23 and 24 respectively – are the first two dancers to move up the HSDC chain from summer intensive students to members of HS2 to being promoted to the main company. All in two years. Both dancers hail from Michigan, but the similarities in dance beginnings end there. Schultz stated dancing at five taking tap (he wanted to be Donald O’Connor), then began taking ballet classes with his older brother Nick. Once hooked, he took numerous summer workshops that eventually led to an apprenticeship (while still in high school) and then a full-time position with the Grand Rapids Ballet, where he danced for over four years. Klock didn’t start dancing until age 11 with ballet classes. She quickly took to the form and three years later attended a summer program at San Francisco Ballet, where she decided she wanted to be a professional dancer. She went to Interlochen Center for the Arts for high school and after two years at Dominican University, figured it was time to start her professional career. Here’s where there stories come together. Both attended the HSDC summer intensive in 2009 and were asked to join the second company HS2. Landing here happen almost by accident, but now they couldn’t be happier. “I’d known a little bit about the company, but once I got here, I realized how much I really loved the whole philosophy and the rep,” says Klock. Schultz agrees. “Just learning the rep I thought ‘this is it’! 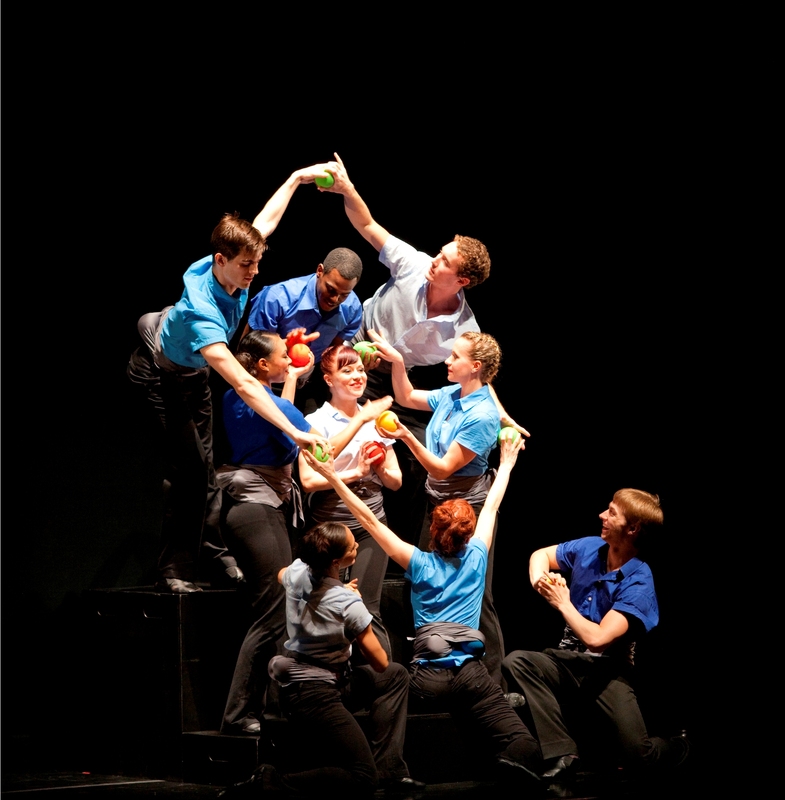 This is what I want to do.” Their success ties into the larger HSDC mission of nurturing the next generation of artists. “David and Alice are great examples to a bigger mission of mine, which is to mentor young dancers and prepare them for a profession in dance rather or not they continue with Hubbard Street or not,” says Artistic Director Glenn Edgerton. “They’ve matured so quickly in all ways, both in their dancing and also in their understanding of how to approach their work creatively and practically. I feel we have been able to tap into their talents and start to challenge them toward their potential.” That potential will be challenged this season with having to learn the previous repertoire that includes masters like Ohad Naharin, Nacho Duato and Jirí Kylián, as well as new company works by a range of choreographers from Resident Choreographer Alejandro Cerrudo to the legendary Twyla Tharp (her world premiere hits the stage this Thursday, Oct 13th). Alice Klock & David Schultz in "Harold and the Purple Crayon". Photo by Todd Rosenberg. Come see Klock, Schultz, along with new HSDC company member Garrett Anderson this week (Oct 13 – 16) at the Harris Theater (205 E. Randolph)as Hubbard Street presents their Fall Series. On the program, a world premiere SCARLATTI by Twyla Tharp, Nacho Duato’s Archangelo and Walking Mad by Johan Inger. Tickets can be purchased by calling 312.850.9744, 312.334.7777 or by visiting the Harris Theater box office. River North Dance Chicago performing "Nine Person Precision Ball Passing". Photo by Cheryl Mann. Saturday night was beautiful. The weather, the venue, the dancing. The perfect night to hold an outdoor, free dance concert for the city of Chicago. At Pritzker Pavilion in Millennium Park, Mayor Emanuel took the stage to introduce the final night of the Chicago Dancing Festival (CDF) and vowed to take the now five-day fest up to six days of free dance events next year. Dubbed a Celebration of Dance, the entire evening was just that. Some of the best dancers in the country came together to dance works by Kylían, Balanchine, Graham and Taylor for the estimated 10,000-12,000 people in attendance. Even the fabulous Gehry-designed concert venue could not compete with what was happening on the stage. Ballet West, under the direction of former Joffrey dancer and Ballet Master Adam Sklute, opened the show with Jirí Kylían’s Sinfonietta. This troupe won a Chicago following last year when they performed Balanchine’s Serenade at CDF. Program notes declare Sinfonietta is “a celebration of our earthly life” and with joyous jetés and rousing score, it proved to be a pitch-perfect opener for our celebration. A black back drop with sparkling lights like stars came clearly into focus when the piece finished just as the sun set and the stars overhead came out. Timing is everything. The woman sitting next to me literally jumped out of her seat in excitement as the piece ended. She seemed embarrassed at first until she realized she wasn’t alone. This was the first of many mini standing ovations of the evening (most of which were started by the Hubbard Street dancers in the crowd). River North Dance Chicago (RNDC) followed with Charles Moulton’s post-modern Nine Person Precision Ball Passing. For the third time this week, RNDC took their places on three tiers to perform the brain-teasing work which has seven minutes of fast ball exchanges in every possible configuration. It is clear that the dancers have it embedded to memory as they performed it perfectly, even throwing in some sassy faces and attitude. It’s a fun work that drew giggles and appreciation. Now if I could only get that pinball-synth score out of my head. Joffrey Ballet performed George Balanchine’s difficult and folksy ballet Stravinsky Violin Concerto. The large group piece features two duets (Victoria Jaiani and Temur Suluashvili, Valerie Robin and Fabrice Calmels) to arias mixed in with all male and all female sections. This work is at times difficult for me (why is she doing inside/out back bends? why are they making a thumbs up sign and waving at each other? ), but it was performed with flair and verve. With fire engine sirens in the background, Joffrey showed the hometown crowd what it’s made of – strong technique, charisma and love. 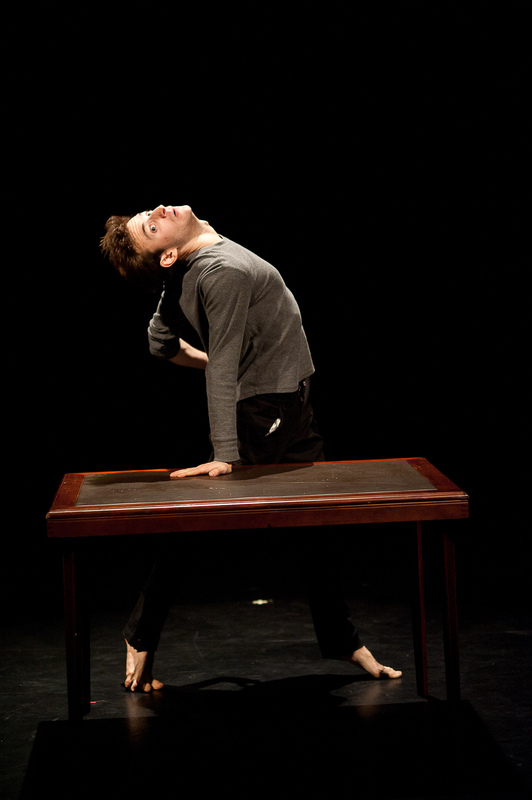 (Shout out to Derrick Agnoletti for his fierce pas de chats!) Martha Graham Dance Company took the stage next in Diversion of Angels. Graham’s trademark pitches and contractions were staples, but with lyrical passes and beautiful lifts mixed in. Carrie Ellmore-Tallitsch, Ben Schultz and the gorgeous Xiaochuan Xie were stand outs. Principal dancers Tiler Peck and Gonzalo Garcia from the New York City Ballet (NYCB) wowed the crowd with a stunning performance of Balanchine’s Tchaikovsky Pas De Deux. The virtuoso duet showed the amazing technique, performing chops and musicality of the dancers. Peck, aside from one slight bobble en pointe, was impeccable. Her pointe work, her presence, her extensions, her turns, her playfulness all came together at warp speed. I felt like a little girl seeing something so amazing that it changed my life. (Mommy, I want to be a ballerina!) I had goosebumps and yes, I was one of the many shouted bravo during bows. The excitement carried over to the final piece. The crowd was ready and Paul Taylor Dance Company did not disappoint. Taylor’s Esplanade set to Bach concertos was original inspired by a woman running to catch a bus. The piece incorporates common human gestures with innovative partnering (a promenade with a woman standing on the man’s stomach), ridiculously fast footwork (Michelle Fleet’s solo was lightening fast! ), running passes and a little romance. The dancers were joyful with smiles on their faces as if they were having the time of their collective lives. The audience was too. *Insert full standing ovation here. Every year, a random bird makes an appearance in the show, flying about the stage above the dancers as if it is so caught up in the moment that it wants to be part of the performance. I imagine much of the audience felt exactly the same way. Just when I thought it couldn’t get any better, it did. Multiple times. Every day the festival got better and better and I can honestly say (although I didn’t “get” some pieces) I enjoyed watching every single dance. Lar Lubovitch, Jay Franke and Evin Eubanks deserve great thanks and kudos for pulling off this hugely successful dance festival. I wonder how they’re going to top it next year. Hubbard Street's Jesse Bechard & Ana Lopez in "Petite Mort". Photo by Cheryl Mann. The Chicago Dancing Festival (CDF) Masters program last night at the Auditorium Theatre was a spectacular night of dance. The packed house was jazzed and ready for a great show giving Mayor Emanuel (who was in attendance again this evening) thunderous applause for just being there. It doesn’t hurt that he’s also the city’s number one dance advocate and biggest fan. The show opened with Hubbard Street Dance Chicago (HSDC) performing Jirí Kylían’s Petite Mort (1991), a gorgeous work to two Mozart piano concertos that has been in their rep since 2000. Between the music, the choreography and the beautiful dancers, it really doesn’t get any better than this. (I told Artistic Director Glenn Edgerton at intermission that I was getting tired of trying to find new words to describe HSDC and that I might just have to make something up. Stellatasticerifficabulous? Nah, that’s harder to say – and type – than Suluashvili!) Anyway, the bar had been set. River North Dance Chicago in "Nine Person Precision Ball Passing". Photo by Cheryl Mann. Joffrey's Victoria Jaiani & Temur Suluashvili in Act II pas from "Giselle". Photo by Cheryl Mann. deux (1841) from Giselle. Please note: I love the Joffrey and Giselle is my favorite ballet (yes, I named my dog Giselle), so it hurts me to say that this was the weakest number in the show. Jaiani was gorgeous, as usual, but the tempo of the audio track was off. It was too fast when it should’ve been slow to show off her ridiculous extensions and slowed down during the filler parts. Plus, you really need to understand the relationship of the characters to fully appreciate what is happening on stage. They would’ve been better served doing a bravura pas from Don Quixote or Le Corsaire or even the White Swan pas they performed earlier in the week. Martha Graham Dance Co's Carrie Ellmore-Tallitsch, Tadej Brdnik & Mariya Dashkina Maddux in "Embattled Garden". Photo by Cheryl Mann. Lar Lubovitch Dance Co in "The Legend of Ten". Photo by Cheryl Mann. Lar Lubovitch Dance Company in The Legend of Ten. 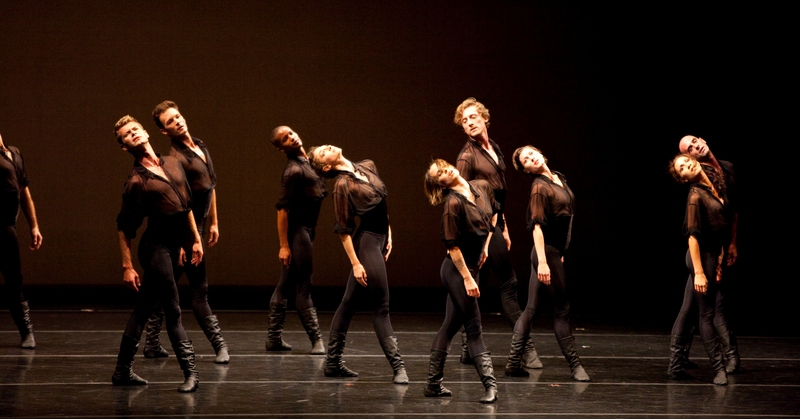 Choreographed by CDF co-founder Lar Lubovitch in 2010, the piece for – you guessed it – ten dancers was wonderful. Set to two movements from Brahms’ Quintet for Piano and Strings in F Minor, Opus 34, Legend showed that Lubovitch is a master with not only movement, but music. 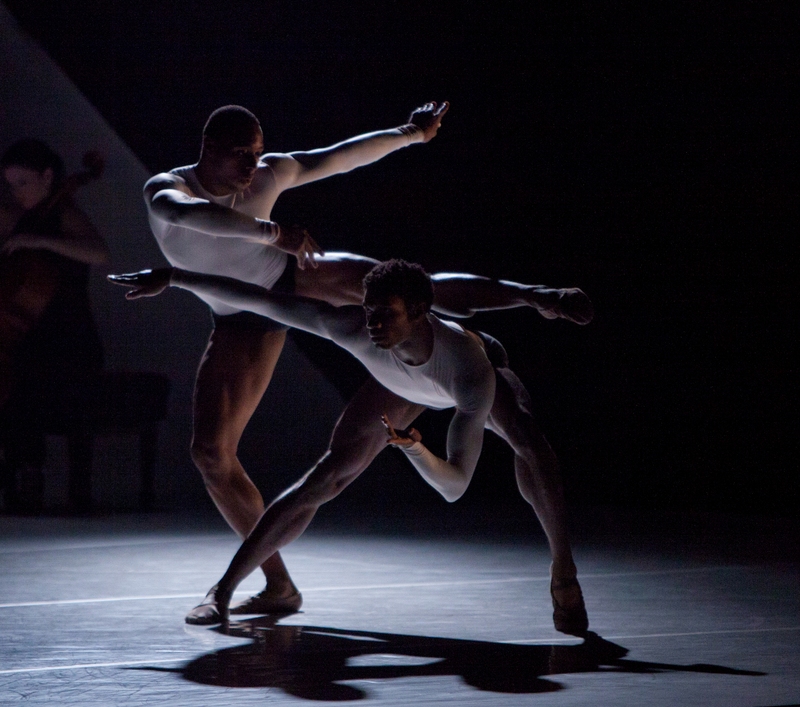 The seamless flow of the dancers’ energy was hypnotic. It could literally lull you into a stupor, but then you would miss the quick little solo turns by each dancer and the smart, luscious partnering by Jenna Fakhoury and Reid Bartelme. 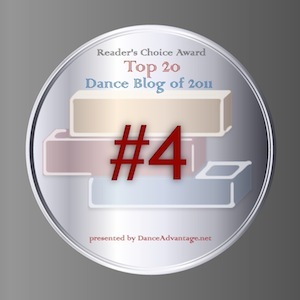 The main thing I’ve noticed in this week of dance so far is the appreciation and appetite for dance in Chicago. The audiences have been attentive and generous and eager for more. That’s my kind of town!